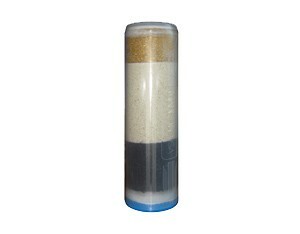 This ANTIRAD-PlusTM cartridge comes standard with the purchase of most of our filter units which can be found here. Made in USA, our premier anti-radiation water filter cartridge is one of the first in the world to allow for treatment of radiation contaminated water in a residential application. It contains the same unique Activated Zeolite Mineral (Purified Granular-Form, Non-Micronized, and with No Heavy Metal Leaching: See Independent Lab Analysis Here) that is being used by Nuclear Facilities worldwide to filter radiation out of their water. This form of Zeolite was successfully implemented during the 1979 Three Mile Island Incident in the United States, during the 1986 Chernobyl disaster, where thousands of tons of Zeolite were air-dropped into the area to eliminate ionizing radiation in Ukraine and it is now being used in Japan to help treat water being released into the ocean by TEPCO. Zeolite adsorbs radiation by a natural process called ion-exchange, this means that certain ions that are "more-preferred" by the Zeolite (cesium-134/137, strontium-90, etc.) are attracted to the zeolite and pulled out of the water, and in exchange, the Zeolite releases one of it's "less-preferred" natural mineral ions. As an example of the potency, the Zeolite in AntiRad-Plus can remove apx. 115ppm of Cesium-137 from over 1000 gallons of water. Zeolite also raises and balances the PH naturally to maintain optimum alkalinity, discourages bacterial growth, and eliminates nitrates and ammonia. Patented KDF55 media for enhancement of water's antioxidant potential (REDOX) and heavy metal reduction. This media works by using purified brass and zinc media mixed together, which create an electrochemical reaction, and like a magnet, pull metals to itself. Food-Grade Activated Zeolite. Our Zeolite goes through a crucial 3 step cleansing and "Activation" process, yielding maximum Zeolite purity, cation-exchange potential and Radioisotope Adsorption. In exchange for absorbing radiation, Zeolite releases trace amounts of sodium ions, which are a crucial electrolyte. It can also release calcium, potassium and magnesium ions as well, and functions as a natural buffer to balance acidic or neutral pH toward alkalinity. NSF Certified Advanced Catalytic Activated Carbon. This is an superior form of activated carbon and is added for reduction of Complex Chemicals and final polishing/taste improvement. Catalytic Carbon is capable of effectively reducing complex chemical molecules such as MTBE and Chloramine, which are of extremely small molecular size and can pass through/evade even a micro-porous Reverse Osmosis Membrane. Regular activated carbon is significantly less effective for reduction of such chemicals. Food-grade calcium media that helps to further increase the Alkaline pH of the water and improve taste. This cartridge size is (9.75" Height x 3" Diameter) and comes standard with all our systems. If you need a system that has fluoride reduction technology combined with radiation reduction, please see our: PureEffect Ultra System.